There were no material TX-5 and finished goods inventories at the start of the last year. The whole quantity of material TX-5 purchased during the year had been used till the end of the year. No factory overhead variances occurred in the last year. There were no work in process inventories at the start and end of the year. The Roberts always uses market value at split-off point to allocate joint cost to all of its joint products. For product X, find the market value at split-off of total units produced during the year. What is the total joint cost for the last year to be allocated among three products. Find the total cost of products X, Y and Z produced during the last year. 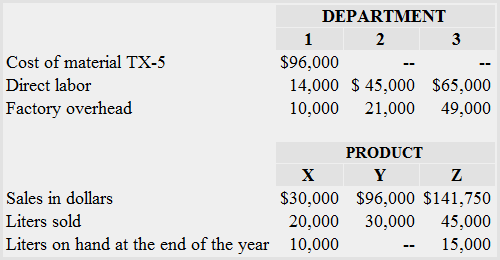 Compute the cost assigned to products X, Y and Z ending inventory. *Joint cost is 80% of hypothetical market value. Hypothetical market value is equal to ultimate market value less separable production costs.